It’s Time To Get Your Nip On! Tile Nippers are one of the most essential and must-have tools anyone needs when working with tiles, mosaics and glass tiles. This simple tool can help chip away chunks of tile and cut small mosaics quicker than any other tile cutting tool. The best part is, they’re very cheap and last for years, making them the best investment you can make when working with tiles. The only problem is, there are so many to choose from! This best tile nippers guide will show you the best tile nippers you can buy, along with some handy tips on how to use them properly. My name is Carl and I have been tiling professionally for over 20 years. I’ve been using tile nippers on the job – daily – for all that time and can safely say, I know my way around a pair of these tile cutting wonders. As simple and easy these hand tools are to use, there is a certain skill you need to learn in order to use them properly. Tile is a stubborn beast and attacking it without proper knowledge will lead to disappointment, keep reading and I’ll teach you everything I know about how to use tile nippers, as well as showing you the best ones! Did you know there are 3 different types of Tile Nippers? I have chosen the best of all 3 and linked them below. Continue reading below to learn more about these tile nippers and see which one suits your requirements the best. Each set have unique qualities designed for making different types of cuts. Ideally, you should own all 3 sets. The QEP compound porcelain tile nippers are great, all round tile nippers designed for nipping ceramic, mosaic and porcelain tiles. Great for taking chunks out of tiles and breaking plates apart for mosaic and craft work. Tilers usually these everyday and are a mainstay tool of any professional. The modern compound mechanism enables twice the breaking strength of regular tile nippers, making these QEP tile nippers a great investment. I use this very same set of Parrot Tile Nippers on a daily basis for nipping out holes in tiles. I create an entry point with my tile saw, then use these to nip out neat, circular holes for plumbing fittings and similar objects. They work very similar to regular tile nippers but they feature a much smaller nipping area and a shape resembling a parrots beak – hence the name Parrot Beak Tile Nippers. The shape enables the tile nippers to fit in tight holes and remove small, precise chunks of tile to create a round hole. I love using these for creating all my holes in tile as I can get a hole cut out quicker than if I used a specialized diamond drill bit. If you work with mosaic or glass tiles, then these Mosaic Tile Nippers are for you. Their strengthened carbide blades work like precise blades and come together to cleanly cut glass and mosaics. They are the quickest way to cut mosaics and glass tile cleanly and accurately, not even a tile saw will work as quickly as this cheap and handy tiling tool. • Mosaic Tiles – Stone and Glass etc. If you are planning to work with tile or are a tile setter, I strongly suggest you purchase all three sets of tile nippers. Each set has its own unique strengths and uses and if you add all three to your toolbox, you’ll have a great set of tools that’ll dramatically increase your work flow. There are many advantages that you will gain by using tile nippers when you work with tile. By investing a couple dollars in a pair of tile nippers, your tile work will get much easier and quicker because while tile nippers are simple tools, they work amazingly well at what they are designed for. • Make circular holes in tiles quicker than any other means. • Pull strips off tile after you have scored them with a tile cutter. • Do things quicker than any other tiling tool. These are just some of the advantages of using tile nippers, you may have known of some of them but I bet some came as a surprise. Yes, there is truly a large number of things you can do with a tool that only costs 20 dollars and once you start implementing those things in your workflow, you’ll truly understand the power of tile nippers. Sadly, tile nippers do have their limitations and those limitations are all tied to how you understand tiles and their structure. In the next section, I’ll teach you how to use tile nippers properly and not make stupid mistakes that 98% of all first-timers make. These first-timers then go on and discredit tile nippers in their reviews and say the tile nippers don’t work! Simply because they were using them wrong! Well, after reading the next sections, you’ll go on to leave positive tile nipper reviews and help clear the name of these amazing little tile tools. This section is intended to provide you with some basic tips and tricks that will teach you how to properly use tile nippers. You will probably find that this section will teach you everything you’ll need to know and you’ll become a tile nipping master in no time! The real trick to using tile nippers effectively is remembering to take it slow! Just like a woman, or a good whiskey, taking it slow yields the best results. Tiles can be fragile and brittle if pressure is applied in the wrong areas and it pays to remember this when you start nipping tiles. 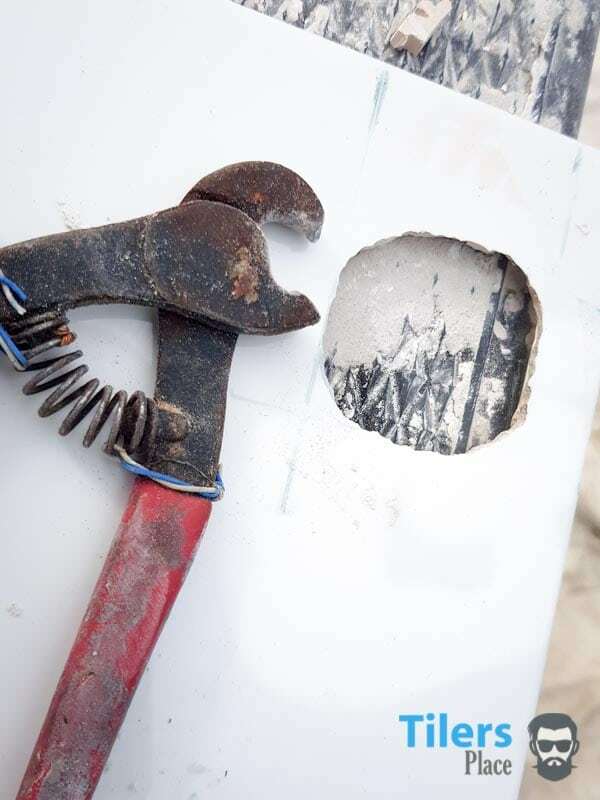 • Take very small bites out of a tile instead of large chunks at a time – You will have greater control over a cut when you remove small pieces and there will be less chance of the tile breaking where you don’t want it to. Taking small bites will also yield a cleaner and neater result. Rome wasn’t built in a day, neither will your masterpiece. Take small bites, whittle away at it slowly and you’ll get a beautiful result the first time. 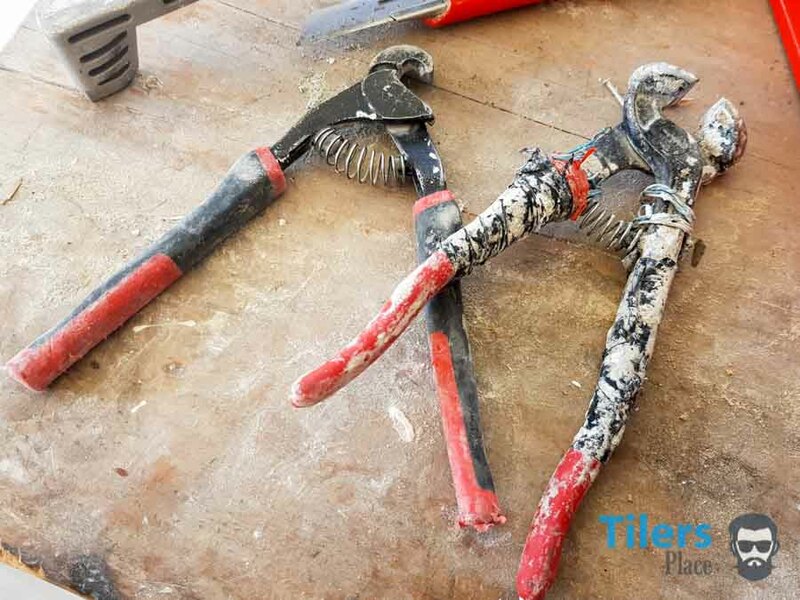 If you follow this tip, you will avoid the most common mistake that everyone makes when using tile nippers and you will enjoy your work more when you are not breaking tiles every other minute. • Use a wax pencil or felt tip pen to mark your line, then score it with a glass cutter – By scoring the tile’s glaze with your glass cutter, you’ll have a much larger success rate of clean cuts rather than having rough and messy cuts. If you are a visual learner, you can check out this brief video on how to use tile nippers. Most of the information provided is accurate, however, don’t use the proposed craft knife to score the tile. A glass cutter is more effective in scoring the tougher glaze of modern, porcelain and glass tile.